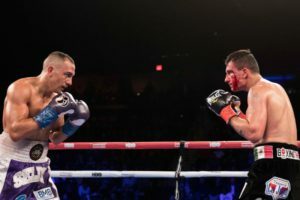 The following is the Boxing Insider notebook for the week of March 26th to April 2nd; covering the comings and goings in the sport of boxing that you might have missed. Laquan Evans took a four-round split decision over Jordan Demko in a a middleweight bout featuring pro debuters. It was a clean sweep as Cecilia Braekhus (35-0, 8 KOs) and Claressa Shields (8-0, 2 KOs) both retained their titles with relative ease tonight. For Claressa it was a dominant showing against the current Super Middleweight champion Fenke Hermans (9-2, 3 KOs). Fenke showed tremendous heart in finishing the bout upright but it was a clear victory for Claressa. From the very beginning there was absolutely no feel out rounds for the reigning unified Middleweight champion. She came out of the gates fast looking to inflict damage on her opponent. Every round looked exactly the same as Claressa made her opponent miss while landing monstrous shots of own. It was the kind of performance from Claressa that showed exactly why she is a super star with only eight pro bouts. For as dominant as Claressa was she takes a back seat to the current pound-for-pound queen and unified Welterweight champion Cecilia Braekhus. The aforementioned Braekhus put on an absolute clinic. Her opponent Aleksandra Magdziak-Lopes (18-5-3, 1 KO) kept fighting until the end but just didn’t have the skill necessary to dethrone the champion. To demonstrate just how dominate Braekhus was tonight she only lost one total round according to one judge. Yes one. That is not a miss print. The two female headliners absolutely showed out tonight but let’s not forget about Juan Francisco Estrada (38-3, 26 KOs) who made a statement of his own tonight by stopping the tough Victor Mendez (28-4-2, 20 KOs). For Mendez it was the first stoppage loss in his career. The reason this is significant is because Mendez has shared the ring with several great fighters, most notably former WBC champion Luis Nery. Estrada punished Mendez all fight long until he was forced to throw in the towel. Estrada has been itching for a rematch with current champion Srisaket Sor Rungvisai. With a performance like he had tonight there is no doubt he will be getting his wish very soon. All of the fights were entertaining tonight. Those who were supposed to win did so and in dominant fashion. As much as I would love to continue to heap praise on these fighters, the attention should be placed on something much more important at the moment. Let’s acknowledge HBO here. The network has officially left the world of boxing after 45 plus years of coverage. Of course the sport of boxing will go on but something will forever seem as though it’s missing. Some of the very best to lace them up both past and present have graced that platform. From Marvin Hagler and Roberto Duran to current great fighters in Canelo Alvarez and Dmitry Bivol. It is a sad day in boxing but as the saying goes, all good things must come to an end. Farewell HBO, you will be missed. HBO Boxing Preview: Shields vs. Hermans, Estrada vs. Mendez, Braekhus vs. This Saturday night from the StubHub Center in California, HBO will be presenting a triple header for the final card on their boxing platform. 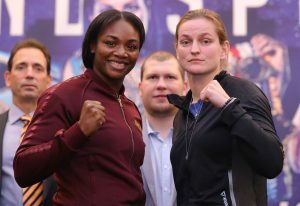 Current unified Women’s Middleweight world champion Claressa Shields (7-0, 2 KOs) will be looking to defend her titles against Femke Hermans (9-1, 3 KOs). For those unfamiliar with Femke she is not only a skilled and tough fighter but she is also the current WBO Super Middleweight champion. Femke dropped down in weight in order to make this fight happen. Femke won the WBO title earlier this year when she dethroned Nikki Adler for the vacant crown. Since then she has gone on to defend her title twice this year. Realizing that the Shields fight was a possibility Femke decided to drop down in weight in order to make the bout a reality. For Shields taking on yet another champion is something she has grown accustomed to. The two time Olympic gold medalist has built her short career on taking the most difficult challenges. In just her second pro fight she captured the NABF Super Middleweight title. In her fourth bout she snagged a legit world title by defeating Nikki Adler for both the IBF and WBC Super Middleweight titles. Earlier this year she entered the record books by becoming a two weight world champion when she dropped down in weight and captured both the IBF and WBA Middleweight titles. Shields is attempting to defend her titles while also fighting on short rest. Just three weeks ago Claressa defended her IBF and WBA titles while capturing the vacant WBC title. Yes just three short weeks later and she’s back in the ring once again. Don’t expect Shields to be fatigued going into this bout as she has grown accustomed to a busy schedule. Both of these women are sure to bring their A games to this matchup. Claressa will be sharing the spotlight this Saturday night with two other bouts of note. Juan Francisco Estrada (37-3, 25 KOs) will be looking to get back in the mix for a title shot when he takes on Victor Mendez (28-3-2, 20 KOs). Estrada won’t just be looking to secure a victory but he will try to do so in dominant fashion. Earlier this calendar year Estrada engaged in a fight of the year caliber contest against current WBC champion Srisaket Sor Rungvisai. Although the bout was close Estrada ultimately lost by majority decision. He is itching to get his chance at redemption but will first have to knock off the tough and durable Victor Mendez. For the aforementioned Mendez this is his opportunity to vault up the rankings and secure his own shot at a world title. Since losing to Arthur Villanueva in November of 2016, Mendez has reeled off four straight victories with his last two coming via knockout. Mendez will be the bigger man come Fight night as he has a three inch height advantage. Checking in at 5’7 compared to 5’4 for Estrada. He has also given contenders a tough time. Just ask former WBC champion Luis Nery as he matched up with Mendez in 2014 and only managed to win by a close split decision. In short, Mendez is no push over. If Estrada is hoping to land a title shot in the near future he will have to leave an impression in this fight. However as we have seen with Mendez time and time again that will not be an easy task. Headlining the card is the consensus pound-for-pound best female fighter in the world Cecilia Braekhus (34-0, 9 KOs) and Undisputed Welterweight champion. She will be looking to defend her titles against Aleksandra Magdziak-Lopes (18-4-3, 1 KO). Magdziak-Lopes is not new to challenging for a world title as this will be her third effort. Her first two attempts came in losing efforts to Mikaela Lauren and Ewa Piatkowska. Magdziak-Lopes however is hoping that the third time truly the charm. Winning her first world title won’t be easy as she’s facing her stiffest competition in Braekhus. Let’s be honest here. The deck is stacked mightily against Aleksandra. She has never faced someone with the skill nor pedigree of Braekhus. However with that being said Aleksandra can take solace in her present form. She has not lost a fight in over two years while defeating the likes of Patty Ramirez and Lisa Noel Garland. Aleksandra also has nothing to lose at this point. If she loses then she was supposed to. There can be no shame in losing to who many regard as being the best fighter on the planet. If she wins however then her life can be changed forever. She has nothing to lose but plenty to gain. It will take Herculean effort to dethrone Braekhus but Magdziak-Lopes seems up to the task. HBO has been the home for almost five decades for the world of boxing. “Prince” Naseem Hamed, Bernard Hopkins, Marvin Hagler, Roberto Duran and Oscar De La Hoya to name a few have all graced this platform. As HBO bows out of the sport it is fitting that they are doing so with the Queen of boxing leading the charge. For the second time this year, Mexico’s Pedro Guevara was forced to deal with the reality of canceled plans for a showdown with Roman ‘Chocolatito’ Gonzalez. For the second time this week, the former 108-pound titlist is about to watch another planned bout fall by the wayside. The 29-year old from Mazatlan, Mexico was reportedly heading for a showdown with countryman Juan Francisco Estrada, who was named as the leading replacement after Gonzalez suffered an injury and was forced to withdraw. However, BoxingInsider.com has learned that talks of the rematch have never advanced beyond early negotiations and apparently have hit a wall. “It’s very disappointing,” Oswaldo Küchle, head of Promociones del Pueblo told BoxingInsider.com on Tuesday of his client being left in the dark less than two weeks ahead of fight night. Guevara is slated to appear on the December 8 edition of HBO’s Boxing After Dark, the telecast’s significance coming in it being the last for the cable giant, whose brass has opted to bow out of the boxing business after more than 45 years of service. His originally scheduled clash with Gonzalez was budgeted to accompany the two best female boxers in the planet, Cecilia Braekhus and Claressa Shields in separate bouts. Braekhus (34-0, 9KOs)—the unbeaten welterweight from Norway by way of Colombia who along with unbeaten cruiserweight king Oleksandr Usyk are the only two undisputed (four-belt) champions in the sport today—enters her 24th consecutive defense of at least one welterweight title as she faces Aleksandra Magdziak Lopes (18-4-3, 1KO) in the main event. In supporting action, Shields (7-0, 2KOs)—who captured Olympic Gold for the United States in 2012 and 2016—defends her unified middleweight titles versus Femke Hermans. The men’s side of show took its first hit when Gonzalez struggled to push through a knee injury suffered during training camp, thus opting to sit out the remainder of 2018. Guevara (32-3-1, 19KOs) was thrilled that he would remain on the show after his team discovered over the weekend that a quick replacement was potentially found in Estrada, a former two-division titlist who was already training for a planned stay-busy bout at home in Mexico. Loeffler has served as an intermediary between Promociones del Pueblo and Zanfer Promotions head Fernando Beltran—the latter whom represents Estrada—given that the two Mexico promotional powerhouses are longtime rivals who rarely do business together, and time is of the essence in keeping the December 8 show afloat. It doesn’t seem to matter to the Estrada side, who is now apparently balking at the proposed match. Guevara is doing his best to remain the consummate professional, regardless of who he faces and where it takes place. Once among the best junior flyweights in the world, he’s since moved up in weight after a failed bid to become a two-time titlist in a tightly contested decision loss to the excellent Ken Shiro last October in Japan. Two wins have followed, although neither have come against his intended target in Gonzalez. Given the constant change in plans he’s been forced to endure in 2018, it’s easy to see why Guevara is eager for a big fight—or at least concrete plans. The fallout with Gonzalez was the second time in less than seven months that a pairing between the two hit the scrap heap. Gonzalez—the former pound-for-pound king and four division champ—was forced to bow out of a planned clash in May when a massive visa backlog kept him grounded in his native Nicaragua. Guevara went on to take a stay-busy fight later than month in his hometown of Mazatlan, along with a 10th round stoppage win over Roberto Sanchez this past September in Ciudad Obregon. Both bouts aired live on Televisa, with whom Guevara is aligned through Promociones del Pueblo. Estrada and the rest of the Zanfer Promotions stable regularly fight on TV Azteca in Mexico. Rival promoters offering content on rival networks will go a long way in explaining why the two sides don’t conduct much business together. Reliable sources have suggested that local TV rights remains a sticking point in finalizing a Guevara-Estrada clash, although all parties involved have denied such rumors when contacted by Boxinginsider.com. 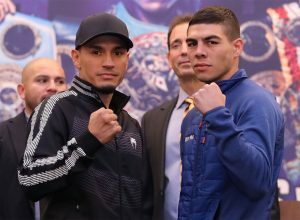 The hope on Guevara’s side was to use the exposure to come from the December 8 telecast to create demand for a third attempt at getting Gonzalez in the ring. “He’s (still) a great fighter and we both aspire to once again become a world champion,” notes Guevara. “I very much hope we can still do the fight in 2019. Hopefully, it’s an opportunity he gets to take at all. On Saturday night, Superfly 2 will take place at the Forum in Inglewood, California and will feature several of the best super flyweight boxers in the division today. The first Superfly card featured a stunning upset by Srisaket Sor Rungvisai over longtime pound for pound kingpin Roman “Chocolatito” Gonzalez and the super flyweight division features some of the best pound for pound boxers today. The undercard will feature a WBA Flyweight title fight between Brian Viloria and Artem Dalakian. The winner of that bout could be a future opponent for any of the main card fighters. The following is a preview of all three televised fights. The opening bout of the night will be a title fight between Filipino Donnie Nietes and Argentinean Juan Carlos Reveco. Nietes has been a world champion since 2008 and first held a title in the minimum weight division. The problem with Nietes is that he has fought mainly in the Philippines and has not faced significant opposition, despite the fact he has had a long title reign. Nietes is already thirty five years old and his opponent is thirty four years old. Both boxers are considered by most to be near the end of their prime. Reveco is giving up about an inch in height and about two inches in reach to Nietes. Nietes is not known for his power. He has stopped twenty two of his opponents, and he only has one stoppage victory in his past five fights. Reveco has nineteen stoppage victories, and zero stoppage victories in his past five fights. Reveco has been to Japan to compete in world title fights, but mainly fights in Argentina. He has fought twice in 2017 and once in 2016. Nietes only fought once in 2017 and twice in 2016. Nietes has been a world champion since 2008 and has defeated the likes of Edgar Sosa, Raul Garcia, Moises Fuentes, and Gilberto Medina. Most of his opponents would be relatively unknown to most American boxing fans. Reveco’s resume is also lacking that big win to tout. He has defeated the likes of Felix Alvarado, Karim Guerfi, and Masayuki Kuroda. He held the WBA World Flyweight Title for about two years. His losses were to Kazuto Ioka twice and a loss early on in his career to Brahim Asloum. Nietes does have some fanfare in the Philippines but at the age of thirty five it’s unlikely he’ll ever catch the same kind of popularity and fanfare of Filipino legend Manny Pacquiao. Nietes has the talent to pull off the victory on Saturday, but it’s likely his next fight will be against another competitor on Saturday’s card that will be highly favored over him. This is the only bout of the night that is not an official title bout. But Carlos Cuadras is one of the best contenders in the super flyweight/junior bantamweight division. Arroyo is thirty two and is three years older than Cuadras. They both are the same height, but Cuadras will have about a two inch reach advantage on Arroyo. Both Cuadras and Arroyo had success in the amateur level, but only Arroyo represented his country in the Olympics. Arroyo represented Puerto Rico at the 2008 Olympics and won gold at the 2009 World Amateur Boxing Championships. Cuadras fought twice in 2017 and twice in 2016. He has twenty seven knockouts on his resume but only has one stoppage win in his past five fights. Arroyo fought zero times in 2017, once in 2016, and once in 2015. He has three stoppage wins in his past five fights. Arroyo’s inactivity is of concern. He has lost two of his past three fights. His losses so far in his career were to Roman Gonzalez and Amnat Ruenroeng. He also lost early on in his career to Takashi Okada. Arroyo does not have a lot of big victories on his resume. He defeated the likes of Ronald Ramos, Miguel Tamayo, and Foilan Saludar. Cuadras has been very active and fought two very close decision losses to Juan Francisco Estrada and Roman Gonzalez. He has victories over David Carmona, Luis Concepcion, Wisaksil Wangek, and Victor Zaleta. 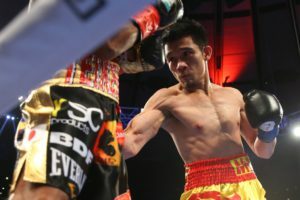 Wisaksil Wangek is also known as Srisaket Sor Rungvisai, the man who fights on Saturday’s main event and the man who recently beat Roman Gonzalez. Arroyo’s inactivity and losses in recent fights are big negatives that are hard to ignore. Cuadras should be able to walk out the victor. Rungvisai became a well known name in the boxing community when he won a stunning majority decision over Roman Gonzalez in March of last year and then followed it up with a career defining knockout over Gonzalez in their rematch. 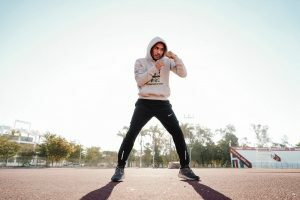 While his power and conditioning cannot be denied, he still has readily apparent weaknesses that technical boxers should be able to exploit. Rungvisai, a southpaw, is four years older than Estrada. Rungvisai will also be giving up about an inch in height and about two and a half inches in reach. Rungvisai fought twice in 2017 and five times in 2016. In activity will not be an issue for him. Three of the past five fighters he faced were making their professional debut at the time. Estrada fought twice in 2017 and once in 2016. Rungvisai notable victories were his two over Roman Chocolatito Gonzalez. He had no other notable victories prior his fights with Chocolatito. Three of his losses were early on in his career to Akira Yaegashi, Yushin Yafuso, and Kenji Oba in Japan. His only other loss was to the co-main event participant Carlos Cuadras. Estrada’s only losses were to Roman Gonzlaez in 2012 and to Juan Carlos Sanchez in 2011. He has defeated the likes of Brian Viloria, Milan Melindo, Giovani Segura, Hernan Marquez, and Anuar Salas. Rungvisai was able to win HBO’s Fighter of the Year in 2017, but he’s facing another talented opponent on Saturday in which he’s expected to be the underdog. Rungvisai has shown he can hang with some of the sport’s best, but he’ll need to be fighting at his best in order to pull off another upset on Saturday. The following is the Boxing Insider notebook for the week of December 5th to December 12th, covering the comings and goings in the sport of boxing that you might have missed. Tickets for the Ali Trophy semi-final bout in the cruiserweight edition of the World Boxing Super Series between WBO World Champion Aleksandr Usyk (13-0, 11 KOs) and WBC World Champion Mairis Briedis (23-0, 18 KOs) are on sale now via bilesuserviss.lv with prices starting at €50. This biggest Cruiserweight unification fight for several years, takes place at the Arena Riga in Latvia on 27 January 2018. Shields, her trainers, and Salita Promotions’ founder, Dmitriy Salita, will be available for photographs and interviews. Tuesday, December 12 – OPEN TO THE PUBLIC! Following the overwhelming success from the first SUPERFLY event this past September, Tom Loeffler’s 360 Promotions in association with Nakornluong Promotions and Zanfer Promotions is proud to announce the highly anticipated second installment, SUPERFLY 2, set for Saturday, February 24 at the Forum in Los Angeles, CA televised live on HBO Boxing After Dark beginning at 9:30 p.m. ET/PT. SUPERFLY 2 will be headlined by WBC Super Flyweight World Champion SRISAKET SOR RUNGVISAI, (44-4-1, 40 KO’s), of Si Sa Ket, Thailand, defending his title over 12-rounds for the second time against former world champion and #1 ranked mandatory challenger JUAN FRANCISCO “El Gallo” ESTRADA, (36-2, 25 KO’s), of Sonora, Mexico. Advance tickets for SUPERFLY 2, priced at $250, $150, $100, $60 and $30 will go On-Sale Tuesday, December 12 at 12:00 p.m. PT and can be purchased through Ticketmaster (Ticketmaster.com, 1-800-745-3000) and the Forum Box Office. The Forum is located at 3900 W. Manchester Blvd, Inglewood CA 90305. “It’s very exciting to announce the main event for the second installment of our SUPERFLY series. With the tremendous response from fans and media from our first event and overwhelming anticipation to our second, we join boxing fans in saying that we ‘can’t wait’ until February 24 at the Forum,” said Loeffler. 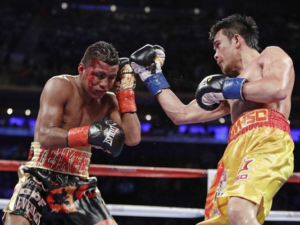 The 30-year-old Sor Rungvisai made his United States debut on March 18 shocking the boxing world with a 12-round majority decision over then undefeated and consensus #1 pound-for-pound fighter Roman ‘Chocolatito’ Gonzalez at Madison Square Garden. Dropping Gonzalez in the first stanza, Sor Rungvisai would capture the WBC Super Flyweight World Title in a hotly contested battle that had the massive crowd on their feet throughout. 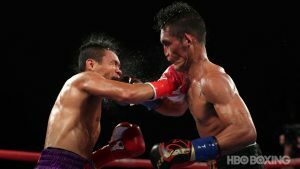 Rematching Gonzalez on September 9 at The Stubhub Center, Sor Rungvisai would drop the four-division world champion twice in the fourth round, the second resulting in Sor Rungvisai being awarded the knockout stoppage erasing any controversy from the first fight. Sor Rungvisai also previously held the WBC Super Flyweight World Title defending it once before losing the title to Carlos Cuadras on a technical decision on May 31, 2014. Sor Rungvisai had won the title in his hometown of Si Sa Ket, Thailand on May 3, 2013 by knocking out champion Yota Sato in the eighth round. Known for his true ‘Mexican Style’ of fighting, Juan Francisco Estrada has remained one of the most popular fighters in the flyweight and super flyweight divisions throughout his nine-year professional career. 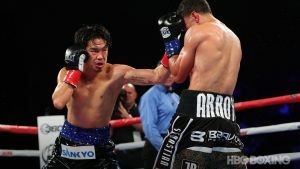 The 27-year-old Estrada won the WBC and WBA Flyweight World Titles on April 6, 2013 with a 12-round decision victory over Brian Viloria in Macau, China. Estrada defended both titles six times before moving up to the super flyweight division. 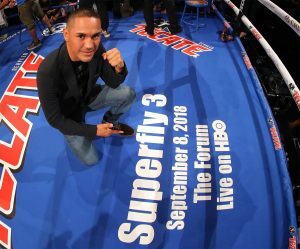 At the inaugural Superfly event on September 9, Estrada fought brilliantly in winning a 12-round unanimous decision over former WBC Super Flyweight World Champion Carlos Cuadras at the Stubhub Center. Estrada has not lost a fight in over six years. On November 17, 2012, he challenged then WBC Flyweight World Champion Roman ‘Chocolatito’ Gonzalez, losing a very close, 12-round decision at the Los Angeles Sports Arena. This past Tuesday, WBC Cares gathered together with local Champions and fighters from the Los Angeles community to fulfill a promise WBC made to the Veterans Home in Barstow earlier this year, to come spend a Holiday Lunch with our U.S. Veterans, our Heroes. Due to the California Wildfires, a few couldn’t make it because of road closures, but we still had great attendance from Champions and WBC Cares Ambassadors, like Golden Boy’s NABF Featherweight Champion, Joseph “Jo Jo” Diaz Jr., WBA World Super Bantamweight Champion Daniel Roman, Former World Champion Paul Banke, Former World Championship Contenders Ruben Castillo and Mando Muniz, Professional fighter and Officer for L.A.P.D., Juan Bustamente, Cutman Sergio Estrada and lastly the WBC Los Angeles team, Pepe & Cecy Sulaiman, Nancy Rodriguez & kids. President Mauricio Sulaiman, and WBC Cares Chairperson Jill Diamond wanted to make sure our heroes received a special gift, the WBC presented all Veterans with an official WBC patch personalized with “CAL VETERANS” as well as a special plaque for the Veterans Home presented by Pepe Sulaiman to the Home administrator. The visit started with our WBC Cares Ambassadors Daniel Roman, Joseph Diaz Jr. Juan Bustamante, Marissa Rodriguez and Ruben Castillo helping serve the veterans and staff a special Holiday Lunch. the Vets had a great time laughing through the line with Ruben Castillo’s jokes and great smiles behind the kitchen line, while the rest of the WBC Family Paul Banke, Sergio Estrada, Mando Muniz ate in the cafeteria with the Vets and had great conversations. After the lunch, WBC presented special gifts to all the Vets who answered Boxing questions, some were present as fans for the Ali vs. Frazier fight! Great stories to hear! Pepe Sulaiman then presented the Home with a Plaque in appreciation for all they do for our heroes, the kids and Ambassadors passed out patches as well as a special WBC cake for all present. The visit ended with many photos and autographs for the Veterans and many smiles. Barstow is over a two hour drive from Los Angeles, the WBC is very grateful to our ambassadors for taking the time to make the drive out to Barstow and helping bring beautiful smiles to our heroes faces this Holiday season. The super flyweight division was featured as two world titles were on the line and one world title eliminator fight was shown. The opening bout was between Juan Francisco Estrada (35-2) and Carlos Cuadras (36-1-1) in an eliminator bout for the WBC Junior Bantamweight Title. Both Estrada and Cuadras have previously lost to Roman “Chocolatito” Gonzalez and were fighting for a chance to have another crack at him. Cuadras came out firing to start the first round and was able to land jabs and combinations to the body and head. Estrada was throwing punches of his own, but wasn’t landing at the rate of Cuadras. Cuadras ended the first round with a hard right cross. Cuadras activity continued into the second round as he was throwing more combinations than the stalking Estrada. Cuadras was showing a good variety of punches in the third round, but Estrada ended the round strong with a hard-left hook to the chin. Cuadras continued to outland Estrada in the fourth and fifth rounds while showboating at times, but Estrada was continuing to come forward and land some hard shots of his own. Estrada picked up his pace in the sixth round and looked like he hurt Cuadras with a combination ending right cross. Estrada’s uppercut was also finding it’s home and the tide of the fight was turning in his favor. 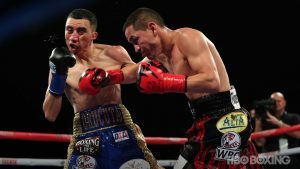 The seventh round went back and forth and featured several heavy exchanges, but Cuadras was showing signs of tiring and his mouth was wide open. Estrada’s left hook was landing in the eighth round. Cuadras may have stolen the ninth round with a heavy right uppercut that snapped the head of Estrada backwards, his best punch in several rounds. Estrada sent Cuadras crashing to the mat in the tenth round with clean straight hand. Cuadras was able to get back to his feet and survive the round, but the knockdown solidified Estrada’s path to victory. Estrada kept up the pressure in the final two rounds of an action-packed bout. At the end of the twelfth round he acted as if he was victorious. Michael Buffer originally announced the final scores as 114-113 on all three score cards for Carlos Estrada, and Carlos Cuadras celebrated as if he won the fight. But Buffer corrected himself and the correct score of 114-113 for Juan Francisco Estrada was read. The next bout of the night was between Naoya “Monster” Inoue (13-0) and Antonio Nieves (17-1-2) for the WBO Junior Bantamweight Title. Tonight, was Inoue’s American debut. Inoue showed off his notorious jab in the opening round and was able to mix in a few uppercuts and left hooks. Nieves was able to block a lot of Inoue’s early punches, but wasn’t able to land anything significant in return. Inoue’s jab was moving Nieves around the end of the ring in the second round and even had Nieves hurt in the final ten seconds of the second, but Inoue thought the ten second warning was the end of the round and laid off a visibly hurt Nieves. Inoue started to land heavy shots to the body in the third round and it’s intensity and ferocity picked up in the fourth. Inoue scored a knockdown with a thudding left hook to the body in the fifth round. Nieves was able to get back to his feet but took a large number of hard body shots in the remainder of the round. Inoue continued his assault in the sixth round and was landing cracking body shots at will. Nieves was not throwing much in return and looked like he was just trying to survive. Nieves corner stopped the fight before the start of the seventh round. Inoue wins by TKO at the end of the sixth round. The main event was between Srisaket Sor Rungvisai (43-4-1) and Roman “Chocolatito” Gonzalez (46-1) for the WBC Junior Bantamweight Title. Rungvisai won a shocking upset in a fight of the year candidate in their first meeting. Rungvisai, a southpaw, looked a lot more confident than the first time they met and came out aggressively and right at Gonzalez. Rungvisai was able to land his right hands and kept Gonzalez uncomfortable with his pressure. Rungvisai continued to be the aggressor in the second round but Gonzalez was able to land multi punch combinations even while he was complaining about head butts. There were several good exchanges in the third round but Rungvisai looked like he was taking the shots of Gonzalez well but landing heavy shots of his own. 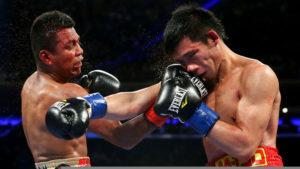 Gonzalez came at Rungvisai at the start of the fourth round but Rungvisai was able to land two hooks to the body followed by a right uppercut, and later followed that with a right hook to the chin of Gonzalez that sent him crashing to the mat. He was able to get back to his feet but still in a dazed state and momentarily exchanged with Rungvisai, but another left hook by Rungvisai sent Gonzalez to the mat for the last time. Rungvisai wins by knockout at 1:18 of the fourth round. On Saturday night the super flyweight/junior bantamweight division will take center stage on HBO as three fights in the division, which includes two world title fights and a WBC junior bantamweight title eliminator will take place. The Stub Hub Center in Carson, California will be the host site for Saturday’s HBO Boxing After Dark Card. This card is stacked in the super flyweight division. Additionally, former UFC fighter Nam Phan will compete on the undercard as well as former world title holder Brian Viloria. The following is a preview of the three planned televised fights on Saturday night. The opening bout of the broadcast will be between Carlos Cuadras and Juan Francisco Estrada, two boxers in the junior bantamweight division that previously faced, and lost to Roman “Chocolatito” Gonzalez. Both boxers stand at 5’4” and have a reach of 66”. Cuadras is twenty nine years old and two years older than Estrada. Both boxers have considerable power. Estrada has twenty five stoppage victories on his record while Cuadras has stopped twenty seven of his opponents. Estrada appears to have the edge in power in recent fights however, he has stopped three of his past four opponents while Cuadras only has two stoppage victories in the past five fights. Cuadras appears to have the slight edge in amateur experience. Estrada claims an amateur record of 94-4, while Cuadras won a gold medal in the International Junior Olympics and won a gold medal in the Pan American Games in 2003. Estrada only fought once in 2016 and once in 2017, but that can be partly explained by a surgery he had to his right hand. Cuadras fought once in 2017 and twice in 2016. Cuadras has defeated the likes of David Carmona, Richie Mepranum, Luis Concepcion, and Wisaksil Wangek. Estrada has a slightly better resume as a professional and has defeated the likes of Hernan Marquez, Giovani Segura, Milan Melindo, and Brian Viloria. This should be an entertaining bout and could go either way, but Estrada is considered by many to be the second best super bantamweight behind Chocolatito and they appear destined to rematch in the near future. Naoya Inoue is a world titlist form Japan that is starting to generate a lot of buzz in the boxing community. He’s a world champion at only twenty four years old and has spent his entire career fighting in Japan. He’ll be six years younger than Nieves on fight night and will also have about a half an inch height advantage. However, he is giving up about an inch in reach. Inoue also appears to have the power advantage. In thirteen fights he already has evel stoppage victories, including three of his past four fights. Nieves only has nine stoppage wins in twenty professional fights and is coming off of a loss. Both boxers experienced moderate success as an amateur. Inoue won the gold medal in the 2011 President’s Cup and Nieves was a silver medalist in the 2011 National Golden Gloves. Inoue has faced good opposition ever since his professional debut. His list of notable wins include Kohei Hono, David Carmona, Omar Narvaez, and Adrian Hernandez. Nieves is coming off of a loss to Nikolai Potapov. His only notable wins were against Oscar Mojica and Stephon Young. Many expect Inoue to wow the crowd on Saturday night with a dominating victory against Nieves. A win may set up a possible big money fight with Roman Gonzalez, provided Gonzalez also wins his bout on Saturday. This bout is a rematch of their barn burner fight which saw Rungvisai pull off the stunning upset victory over Roman “Chocolatito” Gonzalez. Many fans in attendance, and many members of the media, thought Gonzalez did enough to win the fight despite the fact he was knocked down in the first round. In fact, CompuBox stats showed that Gonzalez had outlanded Rungvisai in ten of the twelve rounds, but still wound up losing the fight. Gonzalez and Rungvisai are both thirty years old and stand at 5’3”. Gonzalez will have a slight half and inch reach advantage on Rungvisai. Gonzalez has thirty eight stoppage wins on his record, but has only stopped one opponent in his past four fights. Rungvisai has thirty nine stoppage wins to his resume and has stopped nine of his past ten opponents. However, Rungvisai lacks amateur experience and Gonzalez won the gold medal in the 2004 Central American Championships. Gonzalez fought once in 2017 and twice in 2016. He has defeated the likes of Carlos Cuadras, Brian Viloria, Edgar Sosa, Akira Yaegashi, and Juan Francisco Estrada. Rungvisai fought once in 2017 and five times in 2016. However, three of those fights in 2016 were against debuting fighters and most of his wins came against suspect competition. His biggest wins to date were against Jose Salgado and Roman Gonzalez. He has a loss to Carlos Cuadras on his resume, and his other three losses came within the first five fights of his career. Many felt Gonzalez won their first encounter and many expect him to emerge victorious in their rematch. However, you can not discount the heart that Rungvisai showed in their first fight and he appears to be a boxer with legitimate power in his hands that can end the fight quickly. This should be another entertaining scrap, but it’s a scrap that Gonzalez is expected to win in a way that will take it out of the hands of the judges.